The narcissist may be physically gone but his or her influence remains and it hurts. Whether you have escaped the narcissist or you have been cruelly discarded, the period thereafter is difficult, worrying and painful. Why can't you move on? Why do you keep thinking about them? How can we exert such a hold over you for months afterwards? Why can't you get him or her out of your mind? Why do you see them everywhere you look? Why does it feel like he or she is still buried deep in your heart? Most importantly of all, what can you do to get rid of this feeling? This is the answer. Through the narcissist's perspective you will understand why you have been infected, why it is so effective and how you can successfully exorcise the narcissist from your heart and soul. 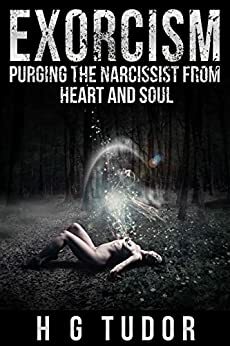 Insightful and informative as always, HG has detailed how the narcissist haunts you and has given practical advice on what you can do to exorcise him/her from your mind, heart and home. A book offering a rare and valuable perspective about why the narcissist in your life has had such an effect and what can be done about it. HG explains what his kind do and why it is so effective, then details an array of actions that can be taken to purge the narcissist from your heart and soul and move on for good. An outstanding book. 5.0 out of 5 starsMaking sense of narcissistic non-sense. Five stars for this work. Much needed advice and information for victims everywhere. Written in an easy to understand kind of way, this book will help thousands. Thank you HG Tudor. Brilliantly written informative book. Exactly what I needed after a brutal discard by a highly charming and skilled narcissist. I highly recommend for anyone dealing with the destructive path of a narcissistic encounter. I really could have used this a decade ago to understand the hell I went through. I am a super Empath and fell deeply for one of these predators. I never did understand it all and knew I would never get an honest answer out of him, but now I know why. It's really chilling to think how calculating psychopathic narcissists are. I lost my innocence and pureness of heart after being demolished by my ex narcissist. This book really helped me understand what happened to me and why he could just fly off in a violent rage seemingly out of nowhere. H.G. writes with intelligence, wisdom, and rarely revealed insight into the narcissist’s mind. He also understands with great depth and perception the empathic perspective and is able to articulate each side clearly and succinctly. I have had several major relationships with narcissists, and although I was able to see the red flags much more quickly with the most recent one, it takes me a really long time to overcome the CD (cognitive dissonance.) Mr. Tudor explains why this is and what you must do to remove the parasite once and for all. It is more than implementing no-contact, it is a process requiring a shift in thinking. Another takeaway for me was understanding the HvH battle, head vs. heart. I now feel I have the tools I need to delete the most recent narcissist and am awaiting my watershed moment, when realize I can’t remember when I last thought about him. The book also mentions why we tend to keep attracting these types; it’s not something we can change or anything wrong with us. There is so much valuable content in this book; having highlighted nearly every page I highly recommend it to anyone who is trying to move on after an encounter with a narcissist. Knowledge is power and the truth will set you free. Write down all the bad stuff they did to you and read it often. 4.0 out of 5 starsRead this if you're struggling to let go. The author is a self-proclaimed narcissist, and he doesn't sugarcoat anything. It's a lot of harsh truths. I've learned and read a lot on the Internet about NPD and narcissistic abuse, but I was beginning to wallow in information and dwell on things I preferred to forget, even years after escaping the situation. Enter this. I wish I'd found it sooner. Practical, tangible steps for freeing your mind of what happened to you - or should I say, what was deliberately done to you. It's not an immediate fix- and the author mentions that. Don't expect to push a button and feel better instantly. If you can be patient with yourself as you reprogram your thought process - which has been manipulated, bear in mind - you'll make progress in time. In my case, I spent years in the "education" phase after what happened to me. Learning about NPD, reading about abuse tactics, love bombing, triangulation, word salad, flying monkeys, projection, etc., and being shocked, appalled, depressed, and just plain livid that people are evil and sadistic enough to live their lives this way. But a point came where I didn't want to be shocked, appalled, and livid anymore; I just wanted to be free of the memories. And in the few weeks since I've read it, the steps in this book have gotten me closer to that than years of self-directed online NPD education. Don't get me wrong. The education was critical. But if you just keep reading about NPD forever, you're unlikely to truly move on. If you're still wrapping your head around what narcissistic abuse entails (which is HARD when you're an empathetic human), maybe pop this one on the wish list for a bit later in your healing process. But if you understand what was done to you, and you're still struggling to let it go...This is the one. Try it. Really do all the steps it provides. I truly believe it will help. I knocked a star off only because the typos are unprofessional and abundant. Stuff like that bugs me. It's nothing that will interfere with your understanding of the content, though, and I still wholeheartedly recommend it for the content.